This is the third "Reader's Challenge" for the blog. It's a fun and informal way to play, create, and challenge yourself with a pre-selected set of components. Let's see what you can make! 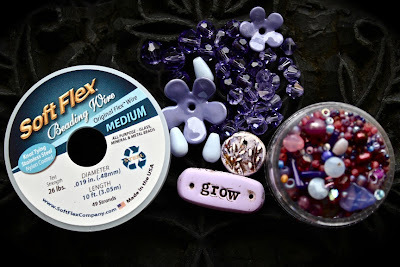 To participate you must purchase a Design Kit from my Shop, featuring a polymer clay link from Heather Wynn-Millican of SwoonDimples, a polymer clay pendant from Heather Powers of HumbleBeads, enameled flowers from Sara of C-Koop Beads, original vintage Miriam Haskell beads, Swarovski crystals, purple-colored flexible beading wire from Soft Flex Company, and a Luxury Bead Blend. The Luxury Bead Blends consists of Japanese Tho seed beads, Miyuki seed beads, vintage Czech seed beads, freshwater pearls, coral chip, garnet rounds, Botswana agate rounds, vintage sequins, and other semi-precious stones, German pressed glass and Czech glass. Each kit also includes a special MYSTERY component! They mystery component will be publicly revealed on Friday, September 16th! If you get a kit, please keep it a secret until the reveal! In selecting the pieces for the Design Kit, I thought about the quality of light at twilight in the garden. September is traditionally a time of harvest, of being in the garden until the light fades from the sky and it's a brilliant wash of pale purples, violets, and lilacs. It's the time before night falls, where stars are just emerging and the last traces of day can still be felt. It's a time of balance... between the fiery reds of summer and the deep blues of late autumn. The color palette reflects that in between time. It's also my birthday month and I wanted to include pieces from some of my favorite folks. If you saw the first two challenges, you know that there are lots of different design options and a single kit can produce several pieces if desired. With your kit, using as much or as little of it as you like, create a piece that showcases your creativity, individuality, and artistic expression. Ideally your creation will spotlight the great artisan components included, but the sky's the limit with what you make. Keep your project secret until the reveal date! The reveal date is Friday, September 30th! 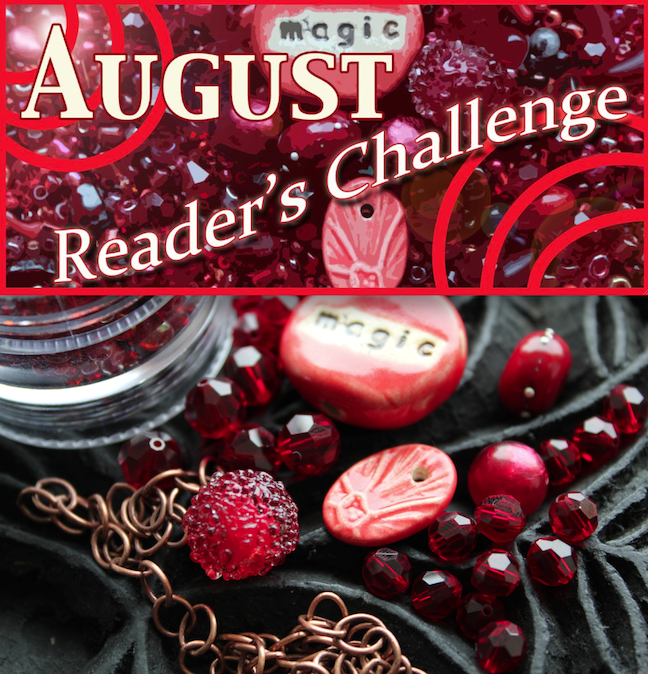 Post a picture on your blog or send one to me (before the Reveal Date) to post if you don't have your own; the September Reader's Challenge will end in a Blog Hop with your other participants to showcase your beautiful creations! 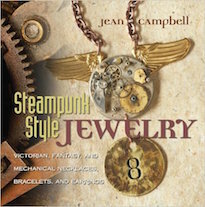 I also wanted to mention that all Reader's Challenge Design Kits are shipped with First Class mail. Due to the relatively short timeframe of this challenge, if you know it takes a long time to receive orders, please place your order early! I will do my very best to get your kit out as early as possible, but unfortunately can't be held responsible if it arrives late! Also, keep in mind that September begins with a holiday weekend! With that said... I hope you all have lots of fun and I can't wait to see what you make! Today is a Gold Star Day! It marks the REVEAL of the second Reader's Challenge on my blog! 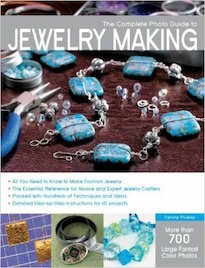 A design kit was created with artisan pieces made by Diane Hawkey, Marsha Neal, Sue Kennedy and Bernadette Fuentes. 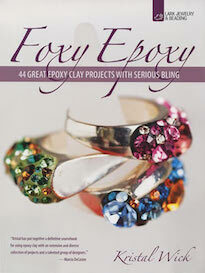 It also included vintage lucite, Swarovski crystals, semi-precious stones, and a Luxury Bead Blend. The kit also included a special mystery component made by me! 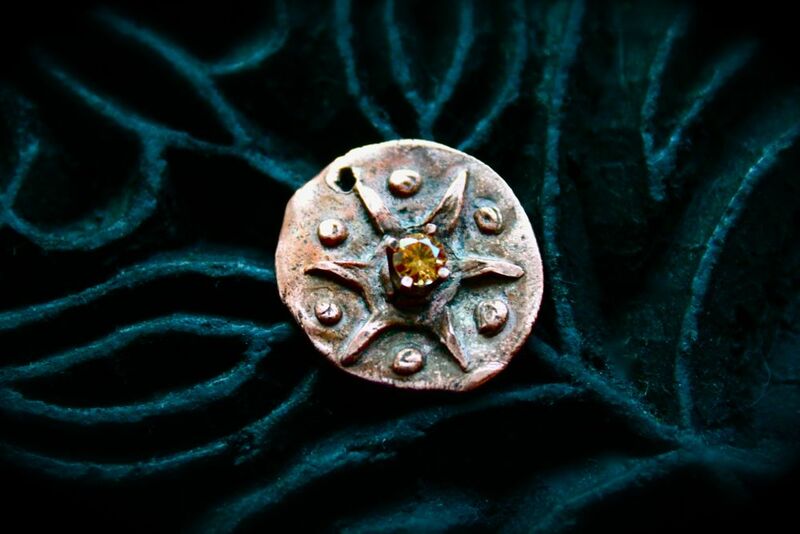 It was a copper sunburst pendant that was pressed out by hand. Participants were asked to create a piece using as much or as little of the kit as they were inspired to. The above pieces were created by Kari Asbury of Hippie Chick Jewelry & Design. She made three necklaces, that I think look great together. Don't you think they look nice layered together? All of them are whimsical, wearable, and just lovely. 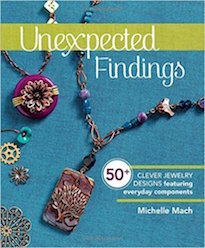 I really like how she's used the large round links in two of the necklaces as accent focal elements – it really draws the eye to the artisan focal components. I titled this piece, “The Magic of People.” It is a tribute to the people who influence my life through their talents, perseverance, or love and support. The art bead pieces are from the kit; plus I included three Bob Burkett shibuichi beads I have had for several years. The Tibetan prayer wheel beads are for the Dalai Lama. Hidden inside the necklace (as in a prison) are two pieces of copper tubing on which I have hammered the prison numbers of Holocaust survivor Elie Wiesel (A7713) and Nelson Mandela (46664). Plus there are three tiny copper goddesses to represent the women in my life, especially my daughter Carole, my granddaughter Gillian, and my friend Margriet. 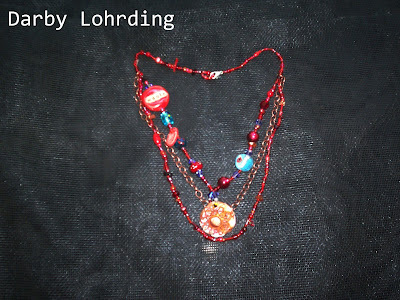 I made the clasp and darkened all the copper findings, and the ends of the necklace are done with kumihimo weaving down to the Tibetan prayer wheel beads. 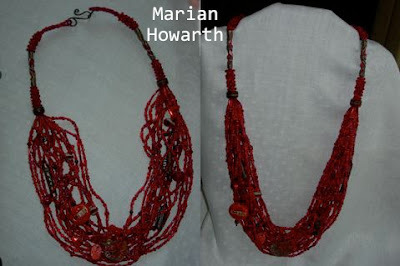 This was a fun piece to do, even though it meant threading 2000 – 3000 beads! The above piece was created by Darby Lohrding. She stated, "I love my creation and the chain tied it all together nicely!! It was the missing link!" The layers of the strands impart an opulent feel. The addition of the blue really pops in contrast with the burnt oranges of the copper and the cascades of red. It's definitely an enchanting necklace. I've been REALLY pressed for time with the preparations for Allegory Gallery. It seems like this has been the MONTH of CHALLENGES! I don't think I've ever participated in so many in such a short amount of time. It has been nice to pull myself away from paperwork and frustrating pitfalls and make some time for a creative exercise. I think it has been really good for my creativity, as the time constraints don't give me much time to mull over design decisions and just MAKE. In this piece I also used a shibuichi link from Saki Silver and a shibuichi toggle from my family at Green Girl Studios. I think the dark, chocolaty patina helps bring the eye around the piece and provide visual counter-balances for some of the brighter reds. 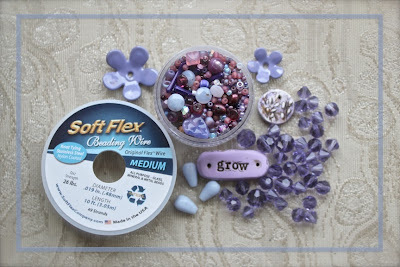 Another challenge for me was using more of the Luxury Bead Blend. Last time, I used only a tiny bit of it. So, this time, I used more. I think the texture of the small beads balances the large links of the copper chain. Patty Gasparino's power was out and she was unable to upload pictures to her blog. Fortunately we were able to figure out a way for her to take pictures with her camera and send them over for me to post here! Just look at her lovely piece! I love the mix of pale blues and reds. It's very striking and has a lot of wonderful texture and details. Very nicely done! Interested in participating in the next round? Keep an eye out tomorrow for the September Reader's Challenge Design Kit! It's my birthday month and it's going to be a particularly nice kit with some really decadent surprises! 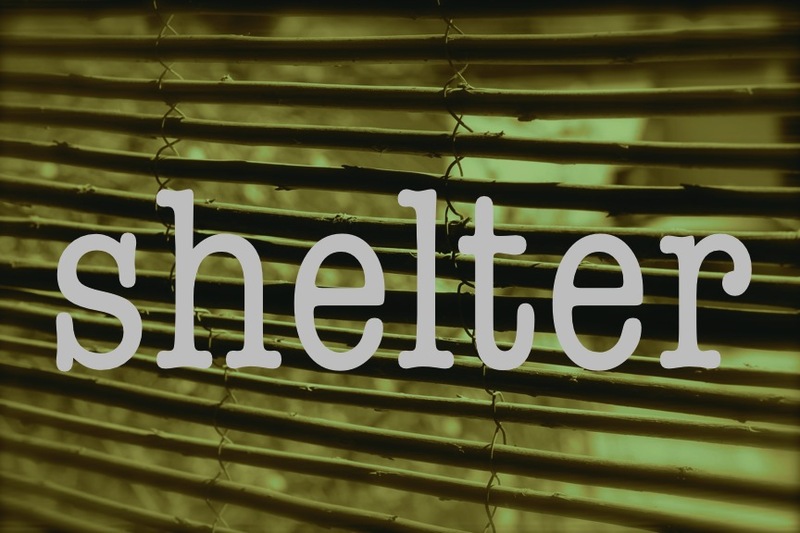 This week's word is "shelter". Create a piece of jewelry, a work of art, or take a picture that, in your opinion, best captures the meaning of the word. Think about the word and its different interpretations and how it makes you feel. Translate it into whatever medium you'd like and then post about it on your blog. Once you've uploaded your blog post, copy and paste the URL into a new comment on this post. Be sure to check out what others are making, inspired by the weekly word. Don't delay; you have a week until the new word is posted. Want to add a bezel to a curved surface? Cyndi shows you one easy way to do it! This week will be “etched” into Carmi’s summer memories as she blogs for John Bead. What does it mean to really be ready – to sell online, to succeed… Charlene shares some thoughts and talks about where she is with this journey. This is the homestretch for raising money for the opening of Allegory Gallery. We've raised approximately 46% of the original goal of the fundraiser. I think that's mighty impressive considering the outside factors, like hurricanes and earthquakes amongst other things. In an attempt to push up the dollar amount as much as possible (you know, for things like tables and chairs) I've listed lots of things in my Shop. It is probably one of the last updates like this before the transition. 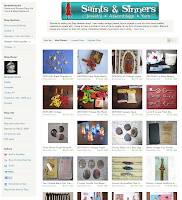 In a few weeks, I will be eliminating almost all of the beads from my Shop and moving lots of stuff over to the forthcoming Allegory Gallery Online Store. When we make the move, I'll be discontinuing several of my personal designs and liquidating some of the stock into inventory for the physical location. So, for example, some of the pieces from the Skull Shop (which will also say goodbye shortly) will only be available in person. If there's something that you know you absolutely must have online, either snap it up before it's gone or let me know. I've been meaning to add these to the Shop for awhile now! These two designs are from Bob Burkett and I just love them. The first is a BRONZE skull bead. It has a wonderful chocolaty brown patina and looks more like shibuichi than bronze. The other is a double scarab in sterling silver. The scarab is an ancient Egyptian symbol of creating something from nothing. Truly an artist's symbol! 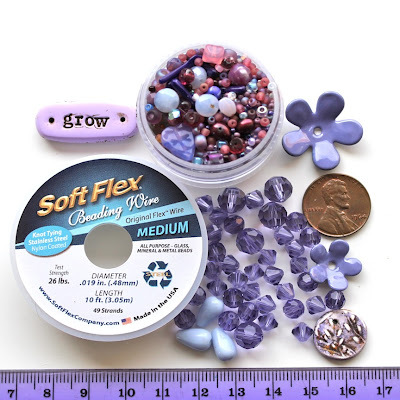 This bead is great for several reasons – they were bought before the skyrocket of silver and the price reflects those material prices and NOT the current market price, which is significantly higher AND there's two scarabs, for double the inspiration fun! I was recently unpacking some boxes (and subsequently repacking them for Allegory Gallery) and came across these vintage fluted daisy bicones in BLUE and YELLOW! I had them up in my Shop in white and was just a smitten kitten with them; they make gorgeous earrings! To be perfectly honest, I'm smitten with a lot of vintage beads and components... many of which are made with a craftsmanship not seen today and in colors hard to come by. 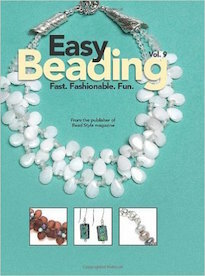 This is not to diminish the quality of ALL beads made today, but sometimes old school is just better. Needless to say, I hoard a lot of vintage components. It's a surprise that I'm even selling these! Finding them in a beautiful sky blue and a canary yellow was a pleasant surprise and I was highly tempted to keep them for myself! Of all the components I've made, this is perhaps the one that gets the most compliments and requests for. Of course, it could be because I often refuse to make the skeleton keys and only made a handful when I did make them. They just take a lot of time and the success rate of them turning out is pretty low. All the conditions have to be just right and I have to use a gentle hand with the carving and with the work-hardening on the bench. One wrong move in the early stages and they're garbage. I have listed a few in COPPER and an even smaller amount in BRONZE! Only two people have them in bronze. My sister, Cynthia and my good friend, Kate Richbourg. I doubt that I will ever make any more of the hand-carved ones. As you may or may not know, I LOVE owls! I loved them before Harry Potter came out and before the recent craze a few years ago when they became popular again. I've been collecting them for over twenty years and have quite an impressive collection of them, if I don't say so myself! Some of my friends would tease me about my "grandma collection" but I would just brush them off and go hunt for more owl friends to add to my collection. My love of owls spurred me on to create this new design I call, "The Night Owl". It's available both in copper and bronze in a limited edition. Each one is different and the expressions on their faces changes with how I hammer them on the bench block. I like that they're all individuals! Another popular request I receive, but rarely fulfill are the pieces with added prong-set stones. While I love the look, they are that much more work and I scarcely have time to make the regular pieces, let alone ones that have to be carefully set. I added two of these Atomic Star pendants with champagne-colored cubic zirconia stones. I think they look magical! 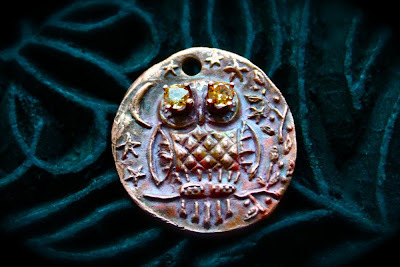 And that love of owls reared its head again and I created two owl redux pendants with CZ eyes. While I like the effect and think it really spotlights the owl eyes, I think that if I make them again with the prong-settings, I might opt for smaller stones. So these are extremely limited editions! One of the often-times sold out design I carved, the Scarlet Pimpernel, has less to do with the French Revolution Era character so many plays, musicals and books are written about and more to do with the actual flower itself. I did find a quote that I quite liked from the author, Baroness Emmuska Orczy, that read: "In the chain of my life, there were so many links, all of which tended towards bringing me to the fulfillment of my destiny." I've created three scarlet pimpernel pendants in copper with prong-setting that include CZs in clear, violet and champagne. 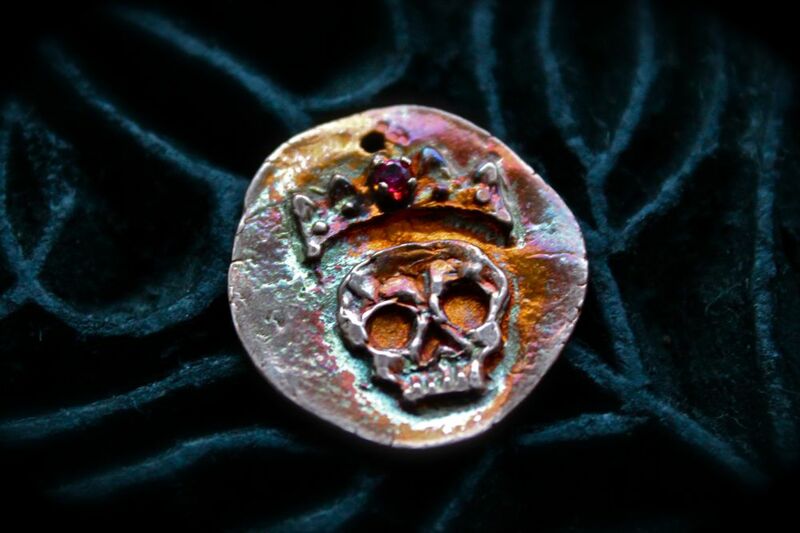 The last new thing in my Shop is a limited edition copper, crowned skull pendant with a synthetic ruby in the prong-setting. Oh, I love this little piece. It's tricky working with such tiny stones, but I think that the jewel in the crown goes well with this piece. I was sorely tempted to keep this one for myself, but decided to part with it for the sake of Allegory Gallery. Will you be in Tucson around September 8th? 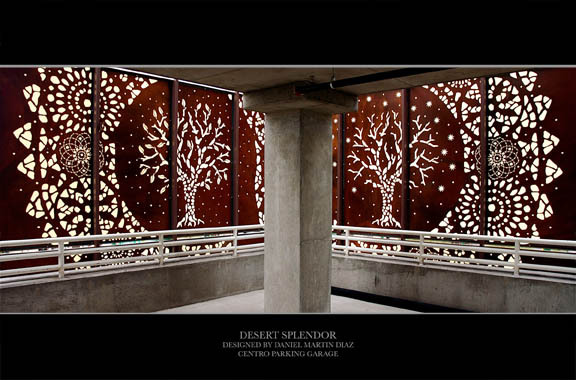 If so, artist Daniel Martin Diaz of Blind Divine and Sacred Machine will be participating with the Mayor and City Council Members in a ribbon-cutting ceremony for the newly installed public art project, Desert Splendor. The event takes place at 8:30 AM at the Centro Parking Garage at 4th Avenue and Congress Street in the lovely downtown. Looks breathtaking from the pictures! 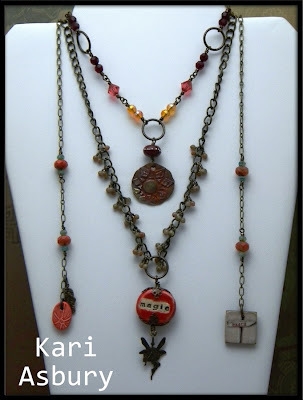 Lorelei Eurto teamed up with Sara from C Koop Beads to generously host a contest. Lorelei randomly selected 23 participants to create a piece using one of Sara's enameled shadow boxes. With everything that has transpired since then, it feels like a hundred years have passed. I was tempted to forfeit, as I have been ridiculously busy with the preparations for Allegory Gallery (opening in less than a week), but decided to take a creative break and work on my challenge piece. I am smitten with reliquaries. There's something magical about the ornateness and the how it is a container for something within. The moment I saw the boxes in Tucson when Sara debuted them, I knew I wanted to create something along those lines. 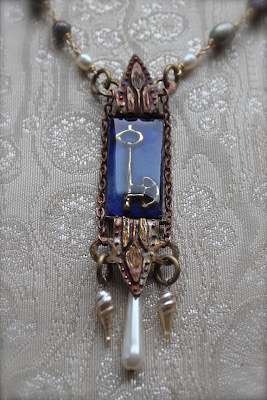 The necklace is composed of a mix of lustrous freshwater pearls, vintage Japanese glass pearls, a bronze clasp from my family at Green Girl Studios, a bronze key also from my family, the enameled shadow box from C Koop, chain from Ornamentea, and copper embellishments that I made myself. My original plans of using the key as a design element was altered when I scooped up everything and moved everything into the other room. The key had found its way in the box and it looked so perfect there. The gold-tones of the bronze perfectly contrasted with the rich blue of the enamel. I knew that I wanted make as much of the enamel visible as possible and using the key was a great way not to obscure the background and to really showcase the negative space. I embedded the key, like a sacred treasure, beneath a layer of resin, keeping it safe... forever. Originally I was going to frame the box in some gemstone chips. But after I did so, it looked too busy. Instead, I used copper chain. It provides a nice contrasting line to frame the piece and a bit of a texture, but not too much to distract. The vintage pearls have been burning a hole in my collection for years. I love them. They have an opulent feeling to them and an interesting provenance. They're over half a century old and were made during the occupation of Japan, and signal the recovery of a war-torn society and the rebuilding of a nation. I am, by nature, a very private and introverted sort of person. A life as a stoic researcher of lost civilizations buried behind books and ancient scrolls, or a life as an monkish icon painter squirreled away painting by candlelight in a crumbling monastery would suit me just fine. In quiet and solitude, I collect and percolate. Ideas germinate and there's much internal activity. It's like my brain becomes a sponge and every little detail of every nuance gets soaked up. Ideas are king here. But that's only one side of the coin. It may be the most natural state, one that left on my own would be the dominate, but there is another... polar aspect. While it is the less "regular" state, it can't be ignored, because it is there and of the two, it is the louder one. This other side is a showman and socialite. Careers as a glittery party promoter, multitasking event organizer, or BOTH at the same time come easily to this more bombastic and fun-loving caricature. In friction and excited stimulus comes rapid growth, fast-firing ideas, and the execution of long-waiting things. In this state, everything is happening on the surface or outside of me. Nothing penetrates deeply and it's all about the general feeling, the movement and zeitgeist. Action trumps all in this state. Somewhere in between is the glue that holds these two facets together. Its role shouldn't be underestimated. The two sides are just crystalline formations of the same material. Neither is dishonest or disingenuous. The coin, whether flipped one way or another, is the same coin. But what does this all have to with anything? While we prepare to open Allegory Gallery, I've been thinking a lot about myself and the events that have led up to this moment. I've been thinking about what it'll take to make everything work. It seems like for a long time, I've been choosing between sides. For the past few years, I've done everything in my power to isolate myself and hide away in my tower. Before that, I did everything I could to put myself out there. I've been cycling through these personas. But now comes a unique challenge, one that can't be faced singularly, but one that requires both sides to work in unison and connect. It's time to move from Analytic Cubism to Synthetic, moving from singularly isolating facets of myself to merging the two, into a single Whole. It's Time to Grow. It's time to embrace the "glue". It's strange really. In this process I never really expected to make such discoveries. When the ball started rolling and the pieces started to fall into place, I never thought that it would form a mirror – a looking glass of revelation, self-realization and internal reflection. I guess it's aptly named. I wrote and re-wrote a blog post about my thoughts on business, and the ideas of success and failure. I deleted those words. Ultimately, they mean very little. I can talk about my ideologies and weave elaborate sentences to bolster my opinions... but without action behind those words, they might as well not exist at all. So I deleted them and went back to work. I do hope that through the opening of Allegory Gallery, I am able to prove my convictions of living a joyful creative life, supporting and inspiring others, and building and fortifying community. If the Passages of Time see fit to remember me, I would like to be remembered as an artist first and as someone intent on seeing. I aim, as most creative people do, to survive off of the work I make and to embrace my tenants fully. If there is "success" it comes from staying true to those words, the words underlined with example and hard work. "Success" is a byproduct... not the motivation. Until then... I will continue working. Now that I've returned from Philadelphia, it's time to get serious! There's only a week and a half left before Allegory Gallery opens and there's A LOT to do before we open the doors. So far, we've raised 34% of the original goal. That's a wonderful start, but I've got to keep pushing until the first customer steps over the threshold. If you haven't checked out the Allegory Gallery Fundraiser, please do! There are some fantastic prizes up for grabs for donations at all levels, from $1 to $1,000! Even if you can't contribute financially, there are plenty of ways to show your support! One way you can help is by Liking the Allegory Gallery Facebook page. It's a great place to find out the latest news about the Store and to interact with other supporters of Allegory Gallery. We also post job positions, giveaways, class inquiries, and general questions there. Responses to the questions help us make plans for the future and shape the vision of the creative space. Our day started dark and early. Through the mist and fog, we made our way across the state to Oaks. We were actually surprised with how quickly we managed to make our way out there. Becki (my mother-in-law) and I squeezed into the packed lobby and made our way into the new location. I noticed how much bigger the venue seemed and felt really excited entering the show. It's an odd sensation, being on the other side of the table. This is the first time that I've been to a show as just a shopper! 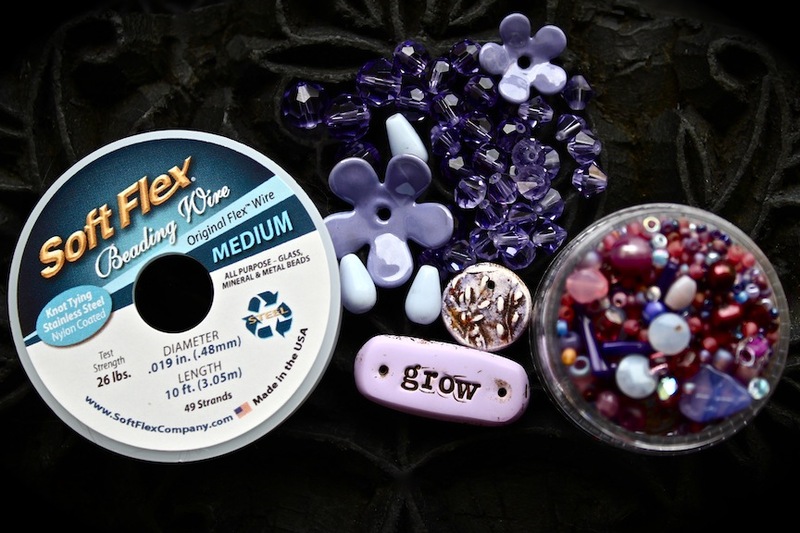 Diana of Suburban Girl Beads. Marsha Neal and Jenny Davies-Reazor. Marg of BeadFX. Michelle McCarthy of Firefly Design Studio and her mom. 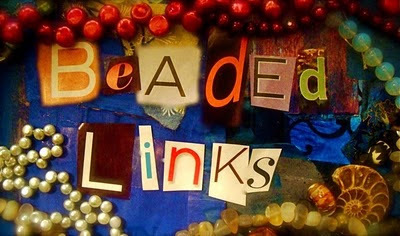 Kelly Russell of Beadfuddled. Jane from Jane's Fibers and Beads. Yvonne of My Elements. Elaine Ray from Ornamentea. Joan Miller of Joan Miller Porcelain. Erin Siegel. Nancy Schindler of Round Rabbit. 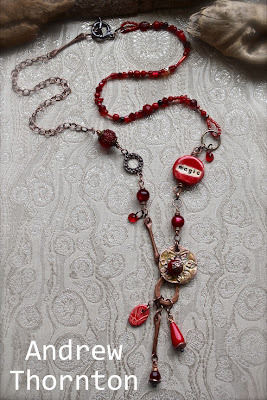 Anne Lichtenstein of Gardanne Beads. Bronwen Heilman. 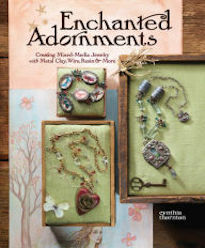 Cynthia Deis of Ornamentea. Carol Wingfield Myers. 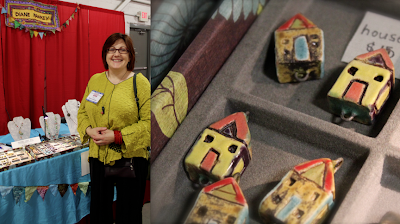 Diane Hawkey and her new ceramic houses. 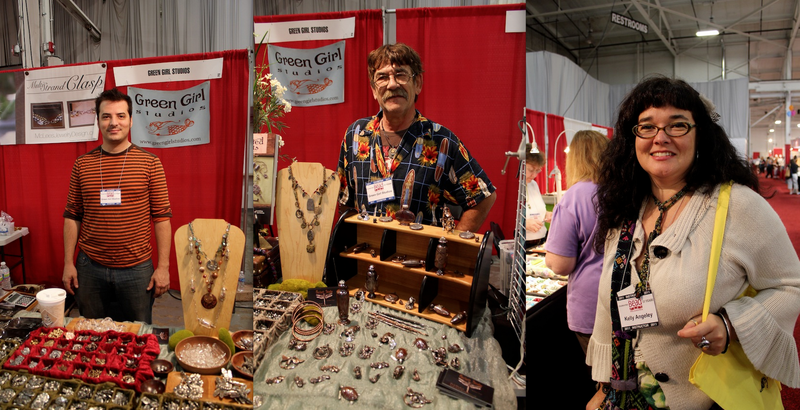 Jess Prill and Cathy Collison of Glass Garden Beads. Greg of Green Girl Studios. Bob Burkett. Kelly Angeley. Aisha, Lisa Niven Kelly and Colin Mahler of Beaducation. 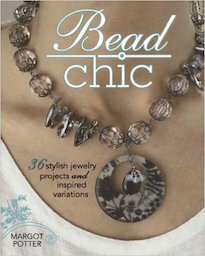 Kate Richbourg of Beaducation. Lorelei Eurto. 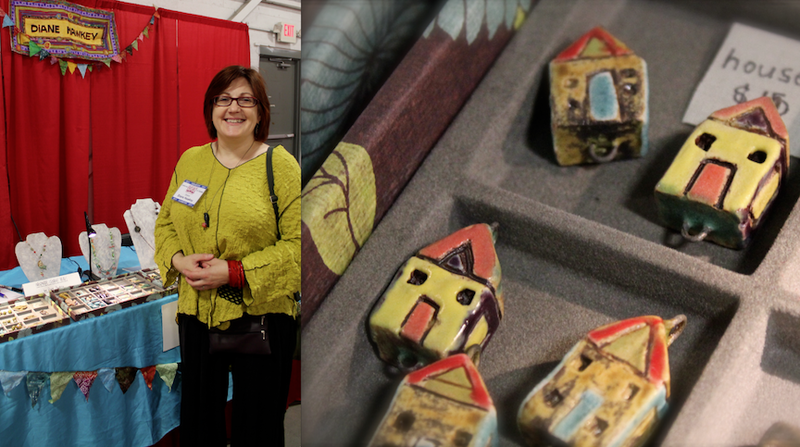 Melanie Brooks of Earthenwood Studio. No it's not an ad for a car commercial – it's just Meredith Roddy! We ran into her in the parking lot on our way out. Afterwards we met up with Erica Cessna of Reed's Beads for a vendor meeting and then we drove back home. It was a long day and by the end of it I had lost my voice, but had a great time. Next year, we'll have to plan to go for the full weekend. I didn't get to see everyone that I wanted to and am sad that I didn't get to talk with many of my dear friends from the show, but am glad to have had the opportunity to see the ones that I did. It was a very full day and one that I enjoyed immensely! This week's word is "redeem". Create a piece of jewelry, a work of art, or take a picture that, in your opinion, best captures the meaning of the word. Think about the word and its different interpretations and how it makes you feel. Translate it into whatever medium you'd like and then post about it on your blog. Once you've uploaded your blog post, copy and paste the URL into a new comment on this post. 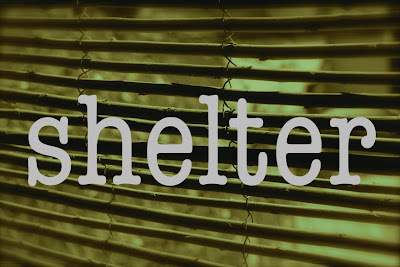 Be sure to check out what others are making, inspired by the weekly word. Don't delay; you have a week until the new word is posted. Carmi uses a great new mold to make “people” donuts. Need some iron in your jewelry diet? Tuesday Tangle has just what you’re looking for! Margot Potter’s new book inspired Carmi’s new linked necklace. The “Mostly Metal” challenge was a great success, many thnaks to Michelle Mach! Come and see all the fun pieces that were made. Try something different with your art beads – ribbon! 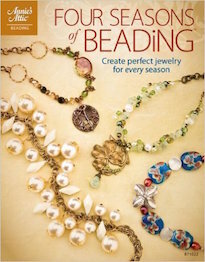 Stop by A Bead A Day to share your ideas for beads Lisa can add to a new bracelet chain. How to win the great giveaway of Maggie Meister’s Classical Elagance–an amazing and breathtaking book! 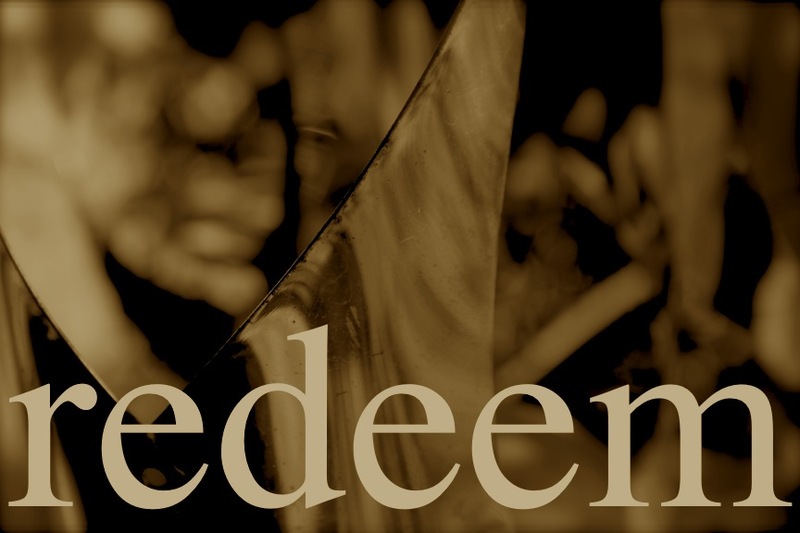 See jean’s blog! Andrew introduces the twelve, talented designers that make up the NEW Allegory Gallery Design Team! Congratulations Mary of Birch Bark Beads! You just won the first Allegory Gallery Giveaway! The prize is a great collection of bird-themed components. Keep an eye out on Sunday for another chance to win! Talented artist and friend, Barbe Saint John is having a moving sale! On the other side of the country? Not to worry! It's a virtual one! Pick up some awesome treasures in her Etsy Shop and help her lighten her load and score some extra moving dollars! Don't forget to use coupon code, SUMMERLOVIN to get 20% off your order! 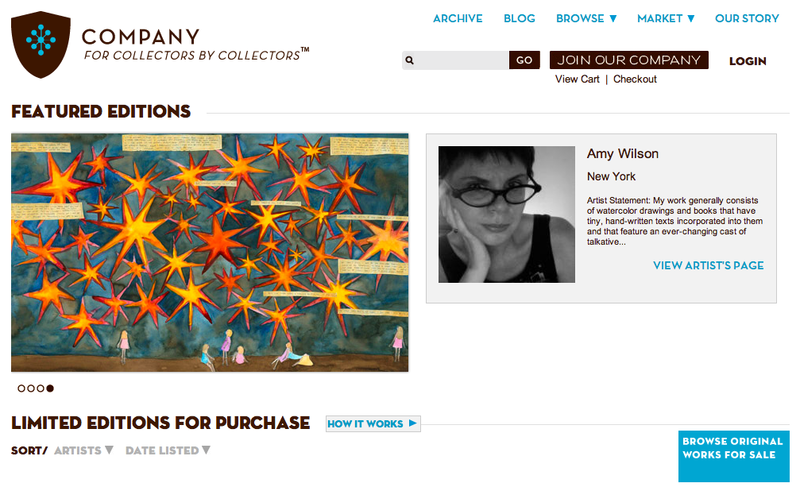 Amy Wilson has two new prints (I Dreamed My Soul and Explosion) available at COMPANY – a new startup by collector CJ Follini. 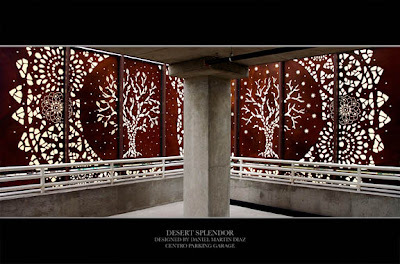 They feature both limited edition prints and originals from contemporary artists. To see what Amy's working on now, check out her blog.